STOCKTON - Modesto's Jeff Belletto knows the main advantage of having the pole position is clean air and open track. It also means staying ahead of hard bumping and jockeying between frustrated drivers in the middle of the pack that can knock a car like his in championship contention out of a race. Belletto, the Western Late Model points leader, survived two cautions to lead the first of twin 50-lap events from the pole to claim his fifth checkered flag of the season ahead of Tracy's Justin Philpott before an estimated crowd of 1,500 spectators Saturday on Fan Appreciation Night at the Stockton 99 Speedway. "The only problem with starting up front is you've got to stay there," said Belletto. "We don't really worry about the (jockeying) going on back there when I've got such a great driver like Dave Byrd breathing down my bumper. Everything is so tight - anyone can win (the championship)." Belletto leads Seaside's Byrd, who finished third in the race, by single digits in the season standings. "The track was real slippery tonight," Byrd said. "It's pretty hard for drivers to gain any headway from back there. Jeff and I and both our teams are really enjoying this season with our cars running well. I have a lot of respect for him and his family. We're both thinking points every race and wherever (the championship) falls, it falls. It's fun." Byrd was not as fortunate in the second 50 when his early collision with Stockton's Greg Potts knocked him out of the race. It left the door open for Belletto to win from his sixth position start and extend his points lead. Belletto took the lead after a pair of yellow flags, then held on ahead of Atwater's Carlos Vieira and Lodi's Michael Wendt through four more cautions, the last on lap 49, for the win under the caution. Stockton's Bobby Simpson earned the victory in the Bomber division main after Stockton's Jeremy Tucker was penalized for rough driving in their 30-lap event. Linden's Mike Massone took the checkered flag in the trophy dash. Lodi's Robbie Knittel won the Super Stock main event after Manteca's Chad Holman and Oakdale's Sammy Solari tangled on lap 25 and were relegated to the back. Manteca's Joseph Reichmuth parlayed his pole position in the B-4 main event to win his second straight race and seventh overall this season to pad his points lead even more. French Camp's Mark Jacke won the dash. Turlock's Wes Miller swept with wins in the Grand American Modified main event ahead of Lincoln's Nicholas Lyons and in the dash ahead of Oakdale's Ryan Stepps. 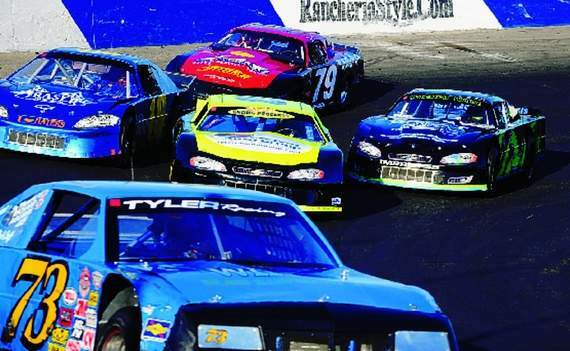 The Speedway next hosts the Whelen All-American Series Race and Ride for Autism Aug. 13. The Late Models will run 100 laps, with Vintage Hard Tops, Ford Focus Midgets, Basic four cylinders, and the third race in the Enduro Series all slated to race as well.